The Purakaunui Falls is a cascading multi-tiered waterfall on the Purakaunui River, located in the Catlins region in Otago in the southern South Island of New Zealand. It is an iconic image for southeastern New Zealand, and were featured on a New Zealand postage stamp in 1976. This 15m waterfall tumbles in three tiers, giving it a certain grace and character that more than makes up for its lack of height. This image belongs to the travel and nature stock photo library. 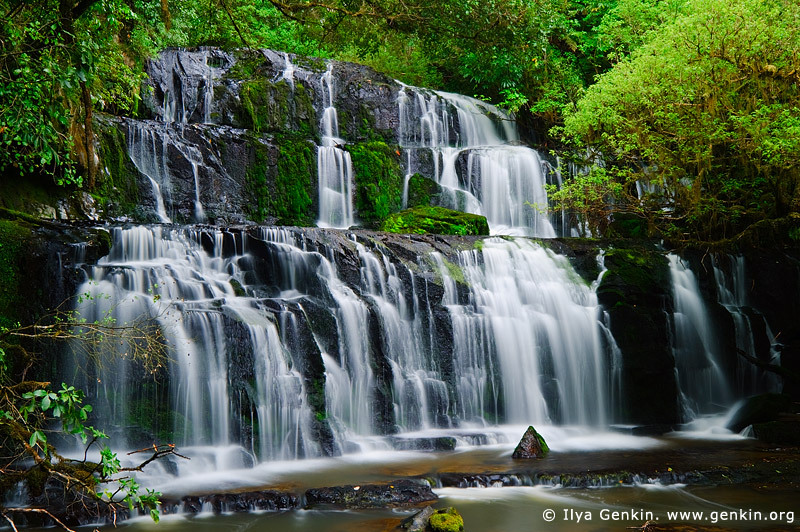 This stock photo of Purakaunui Falls is available for licensing for commercial and editorial uses including websites, blogs, books, magazines, brochures and advertising. Restrictions may apply for images which contain third party copyrighted material or sensitive subjects. Photos of artwork are for editorial use only. This image id NZ-PURAKAUNUI-FALLS-0003 of Purakaunui Falls, is copyrighted © by Ilya Genkin. This is not a public domain image.